A simple and effective variation on the horizontal dado may be formed with hard-wood base and skirting, having a capping to match, filled in with pitch-pine tongued, grooved, and V-jointed match - boarding in narrow widths placed vertically. Framed Dados, as the name implies, consist of a framework of more or less elaborate design filled in with panels, as shown in Fig. 95. The framing should all be properly fitted together by means of mortise and tenon joints. 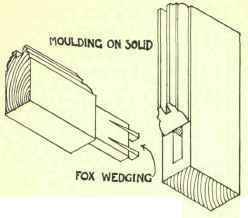 Mouldings where possible should be worked in the solid, and mitred round panels as shown in Fig. 96. Work of this kind should always be put together and wedged up in the shop and sent out in convenient lengths for fixing. External angles in dado framing should be dovetail mitred, internal angles tongued and grooved as at A, Fig. 95, and the capping mitred. 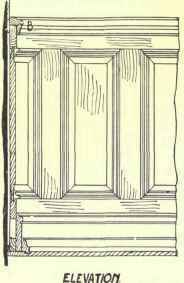 The method of fixing the capping is shown at B, and the junction between the dado and architrave is shown at C.
After the grounds are up it is desirable to fill into all spaces between them one or two coats of plasterer's "rough stuff." This has the effect of stopping draughts and preventing the passage of vermin at the back of dado. Care must be taken, however, that it is quite dry before the dado is fixed, otherwise the dampness will affect the joints in framing. Wall Framing and panelling or wainscoting is the name applied when the whole or the greater part of the walls are covered. In the case of plastered ceilings it is sometimes stopped about 12 to 15 inches below the ceiling, and finished with a moulded capping which is made to serve the purpose of a picture rail. Wall Framing is an elaboration of the principle of framed dado work, the method of construction being the same. 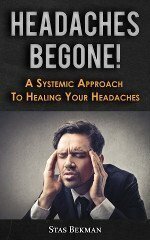 Care must be taken that a correspondingly strong system of grounds and backings be framed for fixing to wall. These should, in the case of all hardwood framing, be provided with secret fixings. The spaces should also be filled in as mentioned for dado framing. As an alternative to covering the walls with all wood work, the plan is sometimes adopted of having a moulded framing only, the panelling consisting of "Lincrusta Walton." This is a material made from a mixture of fibre with boiled oil and driers, rolled on to a textile material and moulded into a variety of designs by heavy machine pressure. This material is a thick pliable substance, turned out in rolls like wall paper, and is fastened to the walls with a thick mixture of paste and glue, in the respective proportions of about two to one. It forms an excellent and effective substitute for panelling. The surface is hard, and has the great recommendation that it will stand washing. Dados are not infrequently constructed of this entirely, the skirting and capping only being of wood. Other materials, however, are frequently substituted for it, considerable latitude being possible. Where it forms the panelling to wood framing, the framing must be arranged to fit flat against the wall and be secured to fixing bricks, no grounds being necessary. Only a very shallow rebate should be cut in the moulding, as shown in Fig. 98, the depth being slightly less than the thickness of the Lincrusta; this causes it to bind tightly down when fixed. The raised pattern of Lincrusta where it comes into the rebate should be carefully cut off. In rooms where there is no dado, or only a low one, and the skirting of slight projection, a moulding is sometimes fixed round the walls at the height of a chair back, usually from 2 feet 9 inches to 3 feet known as a Chair Rail. Its object is to prevent the wall being damaged by having chairs pushed against it. As in the case of dado capping, it is sometimes formed so that small articles may be placed upon it. Picture Rail is the name given to a moulding fixed round the walls of a room just below the cornice, or in cases where there is a frieze it is fixed at the bottom of this. It is moulded in such a way that its top member projects sufficiently to carry a picture hook. A rail of this kind is shown at A, Fig. 99. Another pattern of picture rail is one having small hooks screwed to its face. These support a brass rail upon which the picture hooks are hung - as shown at B, Fig. 99. Picture rails are sometimes made as shown in Fig. 100, so that wires for electric lights or bells may be carried within them. Provision for fixing picture and chair rails should be made when the walls are built by the insertion of fixing bricks in the proper positions, and at frequent intervals. It is advisable to keep a record of these positions, as otherwise great difficulty may be experienced in locating them after the walls are finished, especially in the case of plastered walls.